"Thank you so much for Saturday! Everyone commented on how lovely the music was during the ceremony and the reception drinks. Thank you for making our day special." 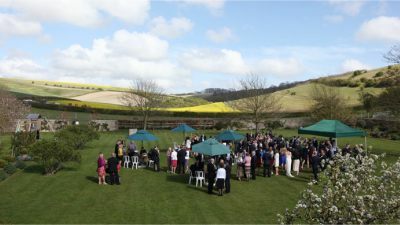 If you’re looking for a wedding pianist for Pangdean Old Barn then look no further. 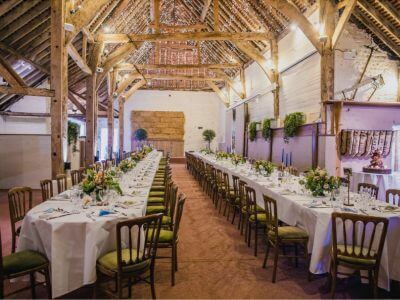 Set in the stunning East Sussex countryside just a few miles from Brighton, the ancient oak-beamed barn at Pangdean Farm in Pyecombe is such a lovely wedding venue and somewhere I love to play piano for wedding ceremonies and receptions. There is no piano at Pangdean Old Barn but I can provide an electronic piano which perfectly recreates the sound of a grand piano – either a standard keyboard-style piano at no extra cost, or for a real wow factor you can hire my high-gloss black mini grand piano. If you’d like me to play for your wedding ceremony, drinks reception or wedding breakfast, or for a friendly chat about any aspect of music for your wedding day, please do get in touch using the contact details below. 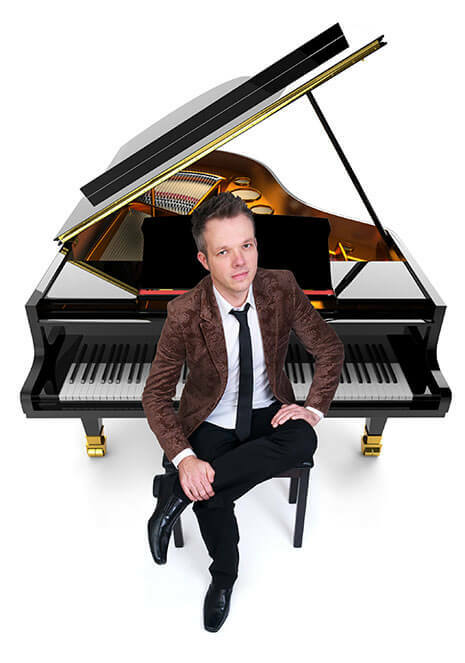 Simon Grand is a Surrey based pianist and composer, and the leading contemporary piano player for weddings in Surrey, Sussex, Hampshire, Berkshire, Dorset, Wiltshire, Somerset, and further afield. As a contemporary wedding pianist, he plays beautiful piano versions of well-known modern songs as well as the more traditional wedding ceremony music. Following the success of All of Me – an album of piano music arranged and performed by Simon Grand (available on Spotify and iTunes) – and his popular YouTube channel, Simon is often asked to perform piano music for wedding ceremonies – perhaps a couple's favourite or special song as bridal entrance music, exit music, or during the signing of the register. For several years Simon Grand was the resident pianist at a five-star hotel and Michelin-starred restaurant, and he is now well established as a wedding pianist in Surrey and the recommended pianist for weddings at a number of prestigious locations – including wedding venues such as Littleton Park House, stately homes such as Loseley Park, hotels such as Hartsfield Manor, country houses such as Russets Country House, and the world-famous Wentworth Golf Club. Simon Grand has been rated 5 out of 5 by 29 reviews. Throughout this process you've been so helpful and prompt replying to queries and we feel very lucky to have had the pleasure of working with you. Any bride and groom who book you for their wedding are very, very lucky! Thank you so much for providing the music for our ceremony and wedding breakfast. It sounded beautiful. Thanks for making our special day so amazing – the music made it perfect! Thank you for being a part of our special day, you played beautifully. We just wanted to say a big thank you for playing such wonderful music at our wedding and the reception. Our guests thoroughly enjoyed your selection of tracks as did we. Thank you for your beautiful music – a perfect addition to our day. I just wanted to drop you a line to say a massive thanks for performing at our wedding – everybody had great things to say about you! Thank you for your superb playing, the music really made the ceremony and drinks in the garden afterwards. Many of our guests commented on how the music was just right and how well your judged the volume etc. We wanted to express our thanks to you for providing such a great soundtrack to our wedding day. We really did have the best day of our lives and your talent and hard work did not go unnoticed. Thank you! Our sincere thanks for yesterday – your playing was a perfect accompaniment to a beautiful day. We had a number of guests ask about you so have given your details to them. We will highly recommend you. A huge thank you for what you did for our wedding. You were amazing and we had many compliments from guests! Many, many thanks again for playing at our wedding day. Your piano playing was truly amazing. And thanks for making the effort to practise our favourite songs. We will happily recommend you! We just wanted to say thanks so much for playing at our wedding – the music was absolutely perfect and really added to the day. Just wanted to say a massive thank you for all your hard work. Everybody raved about how good you were and how it created such a nice atmosphere to the venue. It really made the day perfect. Thank you so much for Saturday! Everyone commented on how lovely the music was during the ceremony and the reception drinks. Thank you for making our day special. You did such a wonderful job at our wedding, and the piece of music you learnt for us sounded amazing. We were really impressed, thank you Simon. A lot of our guests gave lovely feedback about the music too. Just a quick note to say a huge thank you for playing at our wedding on Saturday. We thought that your music was beautiful and a number of our guests have also commented on how lovely it was.